Mothers Day is the beginning of our “baby season”. From this time through September we will be working eighteen to twenty hour days, seven days a week without exception. 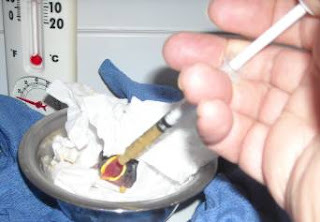 We are used to long days and sometimes even longer nights with critical care cases, but once baby birds are in care at REGI our life begins to revolve around them and their needs. Wild birds began singing this morning at 4:45 A.M. That is my signal to get up and begin my day stuffing little mouths until the crew arrives. We care for a wide range of species at REGI. Passerines, or perching birds are the tiniest babies and have to be fed every twenty minutes their first week of life. They have a huge calorie need to fuel their tremendous growth rate. Some passerines such as the field sparrow and warblers go from hatch to flight in 9 days. You can see why the parent birds are so busy bringing food to the nest. We identify with those busy parents and know exactly what they are going through.  Our region has had several days of freezing temperatures again. That translates into lots of babies not being able to survive in the natural world. As a result we see an influx of fragile patients admitted. Currently we have baby Goldfinches, Pine Siskins and a Field Sparrow in the passerine incubators. The Mallard ducklings that came in last week have grown so much. They weighed in at nearly 9 ounces this morning. That is over half a pound! They hatched just ten days ago and came in weighing as much as quarter. They spend part of everyday outside now, but still need supplemental heat. They are swimming and enjoying chasing each other in the grass. These are games that make their bodies strong and teach them life skills they will need when they are older. 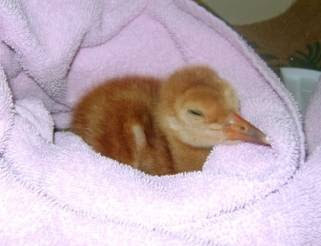 We have a Sandhill Crane colt. He was admitted on Saturday morning from Milladore, WI. Farm workers were tilling a field and accidentally separated the day old colt from its parents. The colt ran into a machine shed where it was found late in the day. By that time he was hypothermic and needed additional care rather than simply be reunited with his parents. We hope to reunite them in the future. Once again it was friend and mammal wildlife rehabilitator Nicki Christianson that did the actual rescue of the colt and cared for it overnight until we could meet at a midway point early the next morning. We are sure Nicki is a real angel. We appreciate her so much. She has her hands full with baby squirrels these days and didn’t need the additional drama in her life that Sandhill Crane colts bring. The Sandhill colt has had a rocky beginning. We nearly lost him this weekend, but he is finally gaining strength. 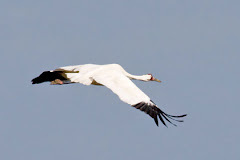 Sandhill Cranes have specific needs to assure they grow and develop normally. For instance even at his tiny size he has to be walked a mile or more a day to assure a proper growth of his muscle and ligament particular those in his soon to be long legs. He hatched at about six inches tall but will be full size and flying in fifty-six days! Without a huge amount of exercise he would soon reach a point where he could not walk or use his legs. And since he cannot be out doors walking alone at this point we are also getting our exercise running him around the track. Sometime very interesting happened here a few days ago. Sadly, it seems our resident wild Sandhill Crane pair has lost their youngster. They are however showing strong interest in our little colt just as he is interested in them. If we are unable to reunite him with his own parents we may well be able to wild foster him to them. It is essential that he maintain his ties with his own species. Once his condition is absolutely stable and the weather warms we will make a strong effort at wild fostering. Stay tuned to see what happens. It will be yet another exciting release day today! The Bald Eagle that was impaled with a seventeen inch stick and was admitted on April 6th (check blog for that day for photos and story) will be released this afternoon at 3:30. Her story is incredible. I will write about it as a separate entry. Lets just say when she was injured she and her mate had eggs in the nest and now they have eaglets. Her mate is and incredible dad and needs a father of the year award! We have a 10 acre piece of rural property and have a pair of sandhill cranes. They recently showed up with 2 babies and just yesterday we found one all by itself. My husband captured it and wants to try to save it. The parents have abandoned it. He has seen this many times before with this same pair. It will readily eat worms, cut we are not sure how to get it to drink water or eat anything else. We have tried an eyedropper for water. We have tried scratch feed, millet, bermuda grass seed heads, small tomatoes and so far all it will eat is the worms. We have plenty of those, but are wondering how to get it to eat anything else. Any ideas would be appreciated. Sybil please give REGI a call right away at 715-623-4015 so we can help. Thanks!